Being an author there are hard decisions to be made. Do you stick with the same characters or try to be someone who writes about different times and places in each book? After the original Red Rising trilogy, author Pierce Brown had the option to stop writing about Darrow’s rise and instead concentrate elsewhere. However, as most people know, once you are at the top there is only one direction to go. Iron Gold is the start of a new trilogy that may just represent Red Falling. Despite his successes Darrow, known across the planets by his moniker The Reaper, has yet to find peace. Sandwiched between the terror of the Rim and the cruelty of the Ash Lord’s inner worlds the fledgling society that Darrow helped create is still in great peril. This new society that treats all colours as equal no longer believes they need a protector in the style of The Reaper and that peace can be negotiated. As always Darrow believes he knows what is best and strikes out on his own terms, potentially bringing further bloodshed to his allies and enemies alike. The original Red Rising books were an interesting evolution from what could be construed as a The Hunger Games homage into a full-blown space opera inspired by Antient Rome. By book three events had moved on immensely. 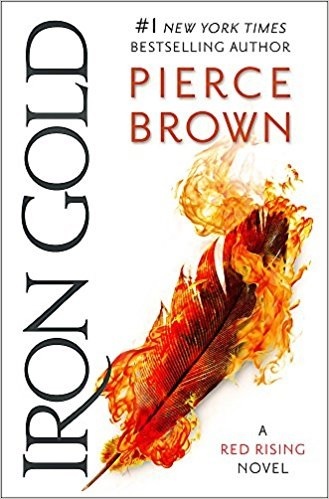 Iron Gold represents a continuation of these original books, but once more Pierce has decided to evolve matters. No longer are we restrained by the single narrative of The Reaper, instead we have a series of different characters who all undergo their own adventures some of them not impinging on The Reaper in any way. By moving the narrative from a single viewpoint to a multiple one Pierce has breathed new life into the Red Rising series, but also moved it towards something that feels more like conventional science fiction or fantasy. The originals were uncompromisingly punchy as Darrow/The Reaper sowed death throughout. Now we leap from that to gentler stories that are given time to grow. The Reaper elements in Iron Gold don’t feel much different from the later Red Rising books so fans are serviced well enough, but I did find them a little too familiar. It is the other sections that shine; especially the tale of a lowly Red who gains a place of comfort, only for their life to be shattered. There is also the story of a master thief and a fallen noble to enjoy. Like any split narrative, it makes the book longer than perhaps it needs to be. Although science fiction, the feel of Iron Gold is more akin to a fantasy book as we witness epic journeys; just in light years, rather than leagues. I found myself enjoying some of the characters more than others and this is a risk of splitting the story. The elements that are not your favourites can drag as you want to get back to your preferred story. Pierce does a reasonable job of making all the tales worthwhile and it is odd that the more traditional Gold stories proved the less fulfilling. It may be that their story was told already in Red Rising, so a chance to follow a Red or a Grey gave new insight into Pierce’s world building. For fans of the original three books Iron Gold is a worthy successor. I would have been happy for Pierce to finish the books after three, but there is plenty of worth still here. As the series continues, I just hope that more time is spent delving into the areas we have not seen yet, rather than going over well covered ground once more. Written on 7th February 2019 by Sam Tyler.